The Potomac Bridge may not have held much historical significance save for the events that happened here on a rainy day in 1859. Henry Kyd Douglas grew up in a mansion on the neighboring hill. One day when Douglas was 19, he crossed the bridge and noticed a man ahead of him struggling to haul his two-horse wagon up the hill. A recluse known as Isaac Smith, the man said he was carrying miner’s tools, and Douglas offered to bring his father’s carriage horses to pull the heavy load. With Douglas’s invaluable assistance, Smith was able to cross the bridge and take Harpers Ferry Road home. A few months later, Douglas learned that recluse Isaac Smith was actually abolitionist John Brown and his wagon was full of pikes (an infantry weapon with a pointed steel or iron head on a long wooden shaft) which he used to raid Harpers Ferry – the raid was the most notable in a chain of events that led to the burning of the Potomac Bridge in 1861. Throughout the next century, the bridge was flooded and rebuilt several times. 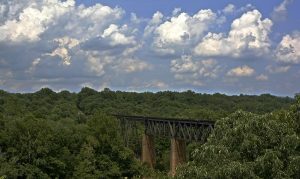 In hopes of preserving the bridge, Maryland listed it in its “Historic Bridge Inventory,” though West Virginia Department of Highways soon replaced it with a new three-span bridge.